Charles Murray is a scholar at the American Enterprise Institute, and the author of books like Losing Ground, What It Means to Be a Libertarian, and The Bell Curve. In this book, he looks at the growing class division in America. 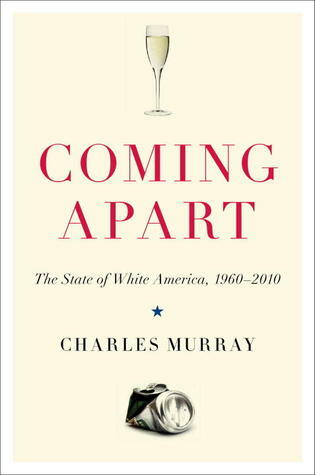 The subtitle of Coming Apart is The State of White America, 1960–2010. Murray’s purpose in only looking at “white” America is to assert that America’s growing inequality is based on class, not race. Coming Apart is quite an interesting read. There is some statistical analysis, as is the case with all sociology books, but Murray is adept at finding and using anecdotal evidence in support of his arguments. Instead of talking about the “upper class” and “lower class” merely as abstractions, he creates the fictional (but based on real places) “Belmont” and “Fishtown,” respectively. When he examines the decline of Fishtown, he views it in terms of the decline of four virtues all readers will recognize: marriage, industriousness, honesty and religiosity. While an entertaining writer, Murray frequently comes across as a curmudgeon, prone to nostalgia and generalization. Murray is a libertarian, and a small fraction of Americans describe themselves as libertarians. This means that not many people will agree with all of Murray’s prescriptions, or even all of Murray’s analysis. I, for one, possess gobs of the religiosity that Murray lauds, and yet I don’t think encouraging people to be religious because religiosity benefits society is a terribly good idea. People hold religious beliefs because they believe them to be true and accurately account for the world as they experience it—not because they think holding those beliefs will be beneficial to society. I don’t think encouraging people to be religious (or even honest, industrious, or devoted to marriage) for the purpose of benefiting society has much power to shape behavior. The benefit to society is only a byproduct of sincerely held beliefs. So the end of the book, when Murray talks hopefully of a “civic Great Awakening,” in which the new upper class begins to preach what they practice, rang hollow for me. There is no possibility of a future Great Awakening without the beliefs that gave rise to the previous Great Awakenings. Murray wants the effect, but his understanding of the cause doesn’t go deep enough. Note: I received a review copy from the publisher. I was not asked to give a positive review.